Compact binoculars with 30mm glass objective lenses, fully rubber coated eye cups with built in compass. 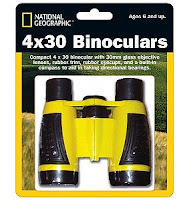 See what you can spot with these pocket-sized 4 x 30 magnification binoculars. This fabulous binocular features 30mm glass objective lenses, rubber eye cups and strap. A perfect starter set for young naturalists. The compact size is ideal for little hands and the built-in compass enables you to take directional bearings. Kids will love using these on their outdoor adventures. * Bright yellow means easily found when lost in undergrowth. * Size and shape means easily gripped by small hands, yet will fold to accommodate young (=close-together) eyes. * It's like looking down two (bright yellow = distracting) tunnels. But hey, when I was three, I was happy looking through a toilet roll tube. I concede, these bins are more fun than a toilet roll. * Other bins have individual eye adjustment. These don't. Though this is irrelevant if both eyes are perfect or at least the same prescription. Also, no adjustment = simpler = better for kids. * Limited range of focus means they cannot easily accommodate short- or long-sight. * The focus wheel is quite stiff - little fingers might have difficulty. Low magnification however, means a greater Depth of Field, meaning less need to focus. Besides, children's eyes auto-focus better than ours.